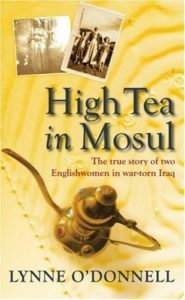 High Tea in Mosul tells the story of two Englishwomen, Margaret and Pauline, who married Iraqi men and lived with them in the northern city of Mosul, as ordinary Iraqi wives and mothers, for 30 years. 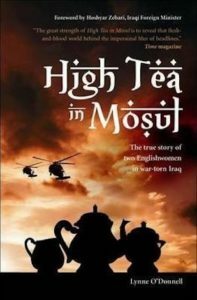 Their story opens a window on the lives of people who lived under the misery of Saddam Hussein’s dictatorship, only to have it replaced by occupation, terror and complete civil breakdown following the 2003 US-led invasion that toppled Saddam from power but left a vacuum quickly filled by criminal gangs, terrorists, and fanatical Islamist jihadists. As the country falls into civil war, the lives of the women and their families are separately shattered by events that unfold as the book is being written. Margaret and Pauline become our eyes on a nation and a people whose fate our own governments and armies have helped shape; their extraordinary stories provide a unique perspective on the horror, going beyond the headlines to bring light to the human face of a country at once so familiar, yet so remote.